My wife and I spent most of the day Saturday cleaning out the basement. Why? Well, part of the reason was to clear an area for my new airbrush station. I decided to take the plunge this week and get into the world of airbrushing. I've been brush painting for over 30 years and always looked enviously at other modelers who had been able to master the dark arts of airbrushing. The technology has improved significantly over the past 10 years, and more and more hobbyists are doing great things with airbrushes...so time to give it a go! OK, so here is the new station...spray booth by Paasche, everything else from Iwata. Iwata Eclipse dual action gravity feed airbrush. I'm going to ask the boss for a siphon-feed version for my birthday this summer. Compressor by Iwata as well. It's fairly quiet and only runs when the airflow is activated through the airbrush. I have a number of projects I'd like to get underway with this new tech...but I really should be finishing my current brush projects first (or at least...at the same time). Played a 35pt game of Warmachine out at the club last night against Elliot's Khador forces. I took a Tier 4 Harbinger list against his Epic Vlad warcaster. Here is the Harbinger, along with her "bodyguards". Here is a shot of Elliot's beautiful cavalry models, backed up with a group of snipers. 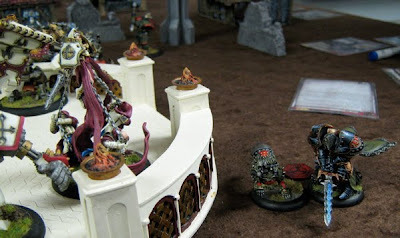 Vlad arrives on the scene with his wardog and a heavy warjack. The killing blow comes from the Harbinger, who casts two Cataclysm spells on Vlad...knocking him into next week. I've really been enjoying the new MkII Warmachine and can't wait for the new Hordes rules to come out this summer. I've got an Everblight army lined up at the painting table waiting for attention after I finish off a slew of Menoth models. 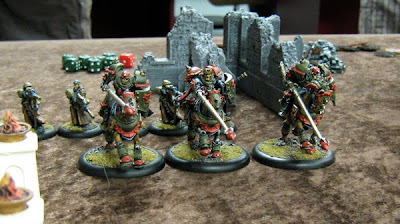 I have a number of Warmachine projects on the table right now. Here are a selection of them, showing the painting progression I go through. 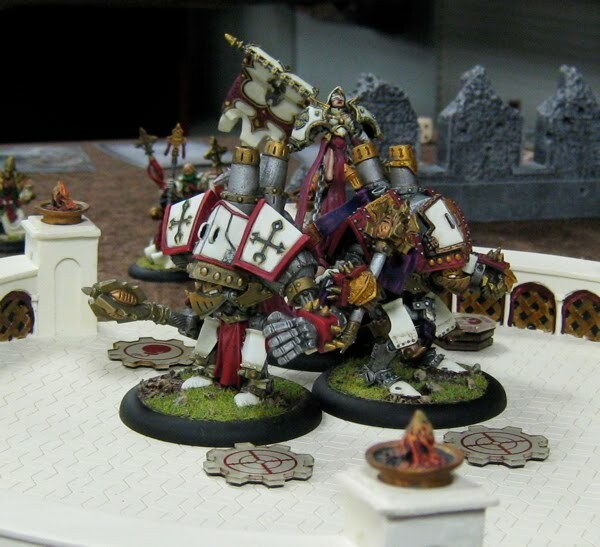 A unit of Menoth Bastions. These are the new plastic multi-piece models. My only complaint is that the polearms were warped. I put them in hot water to straighten them out...but once they cooled they warped again. Bummer... Anyway, here is basic assembly before any painting. I use plastic model cement for the plastic models, while the heavier metal models are glued with 5-minute epoxy and/or gap-filling CA. I don't pin my models...epoxy will hold anything together. Primer coat goes on next and the pieces are glued to their bases. This is a unit of Daughters of the Flame. Warcaster Kreoss, again, just primed at this stage. And a primed Warjack...the Vanquisher. After priming, each unit gets a black wash. This is so that dark recesses I miss with paint layers will at least be black. For the majority of the model, however, I'm painting over white and I find that the colors wind up being a bit more vibrant than if I'd painted over a completely black base coat. Here is the Avatar of Menoth. Here, a Reckoner warjack has had its base colors blocked out. Areas that will become bronze and gold have received a base coat of dark yellow. After this stage, the model gets a wash of brown-black ink to reinforce the details. Then highlight colors are then built up in successive layers. The result...finished pieces. Here are two Dervish light 'jacks that have had their bases completed as well. I've been playing a lot of Warmachine (now in its 2nd edition) over the last few months, and so I'm finally getting around to expanding my force pool. These are three Protectorate of Menoth Warjacks finished this week. First, we have the Blessing of Vengeance light 'jack. The Fire of Salvation heavy 'jack. ...and the Guardian heavy arc node 'jack. All are painted with a combination of Privateer Press and Citadel acrylics and inks. I'm going to start up a couple of more Menoth projects this weekend...so hopefully I'll have some new photos up in a week or so. MayDay is our local Edmonton annual wargames convention. Originally organized by EWG guru, Bob Barnetson about 5 years ago, this year's game day was put together by Craig Blackmore. There were several well-attended games running throughout the day. I ran two games. The first was the Carentan scenario I've been working on for the last couple of months. Here, American player Terry (left) and German players Jonathan and son Matthew pose for a shot over the game table. The Americans made it to the German main line of resistance quite handily, however, at that point things started to go very poorly for the Screaming Eagles. Against pinned Germans in the rubble across the street, the Americans launched three assaults into close combat. Remarkably, they were unable to win a single engagement. The American strength was pretty much sapped at that point and the Terry was unable to get into the town. A convincing German win. I also ran a game of Warbirds in Miniature, a WWII air game in 1/144 scale. Six players participated. This was an American B-17 bomber raid on Berlin. As referee, I ran the bomber stream, while three German players flew FW-190s and three American players engaged with P-51s. In this shot, you can see the tiny fighters darting over the bomber formation. The well-organized German team bypassed the American fighters, flew over top of the bombers and dove in on the rear of the formation. The results were spectacular. While the Focke-Wulfs took devastating defensive fire from the bombers, the American formation was ravaged. Seven of fifteen bombers that hit the table were shot down before reaching their target. Thanks to Criag for running a fun convention day here in Edmonton! Next up...a fair bit of WarMachine. 'Til next time.